DIY Poets started fifteen years ago with the production of issue 1 of our free A6 zine. We wanted more people to read poetry. I had never seen anyone read a book of poetry on the train. We put the zines out in local bars and cafes. We got Arts Council funding for our first couple of years. We originally met monthly in the Peacock on Mansfield Road. Another aim of DIY Poets is to encourage poets to submit their work so they can get their work in print, rather than send it to a poetry magazine in the hope of it getting picked but nobody sees it as the magazine has a national circulation of less than 300. DIY Poets has developed a lot over the last fifteen years. In 2011 we started doing quarterly nights at the Maze and we are having our thirtieth show there on May 10th. In that time I have seen performers develop their confidence and stage craft. We give each DIY Poet five minutes each but also offer a featured slot of up to twenty five minutes. 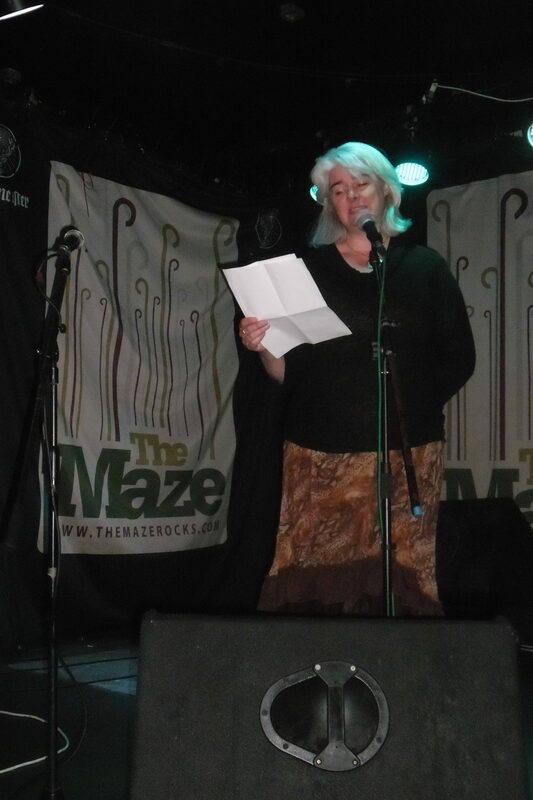 We have also performed at Splendour, the Green Festival, Light Night and at Nottingham Poetry Festival. When DIY Poets first started meeting we had about three people at the meetings. We now have between 15 and 20 people at meetings. We meet on the first Wednesday of the month 8pm upstairs at Broadway Cinema bar on Broad Street (wheelchair accessible with a lift). The first part of the meeting is a business (less boring than that sounds) section of the meeting, looking at poetry events and giving poets the chance to perform at those events. The second part is more informal where poets can show their poems to others in written form and give and feed constructive feedback. We now produce 400 copies of DIY Poets which is now printed on Risograph by Dizzy Ink. We no longer have Arts Council funding but self-fund through members paying between £2 and £5 per month. We have just printed issue 40 of DIY Poets and have expanded to 16 pages. Poems should be submitted to diypoets@yahoo.co.uk and should be 25 lines or less. We also encourage poets to send images with their poems. The zines are full of images that hopefully compliment the poems. On this website people can, among other things, find back issues of the zine, find out about DIY Poets events and read the blogs of other poets. We can also be found on Facebook.